Southwest...The Little Quadrant That Could: Review of "Mary T. & Lizzy K."
Mary T. & Lizzy K., written by Tazewell Thompson, tells the story of First Lady Mary Todd Lincoln and her seamstress Elizabeth Keckly, a freed slave, as the Civil War came to an end and later in life when Mary was in a mental institution. Both main characters are portrayed as strong-willed women, although Keckly’s spirit seems surprising given her start in life. 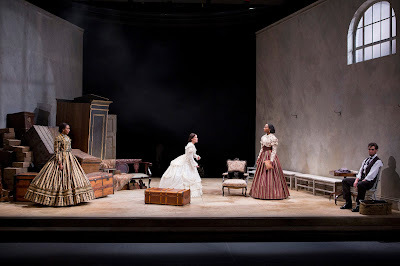 Mary Todd Lincoln is played by Naomi Jacobson, Sameerah Luqmaan-Harris plays Elizabeth Keckly, President Abraham Lincoln is portrayed by Thomas Adrian Simpson, and Joy Jones plays Elizabeth’s assistant Ivy. There were solid performances all around, although Luqmaan-Harris’ portrayal of Keckly seemed a bit forced. Also, I was straining my ears to try and understand what was being said by Jones at times due to her character’s Jamaican accent. Seeing the banter between Mary and Lizzy was amusing as well as President Lincoln’s constant story-telling. Mary T. & Lizzy K. is the first production of Arena Stage’s American President’s Project, an initiative investigating the lives and legacies of the nation’s Presidents and their families. The production runs from March 15 – April 28 in the Kogod Cradle at Arena Stage. Ticket prices range from $40 - $85; however, Southwest Night has already passed for this production.